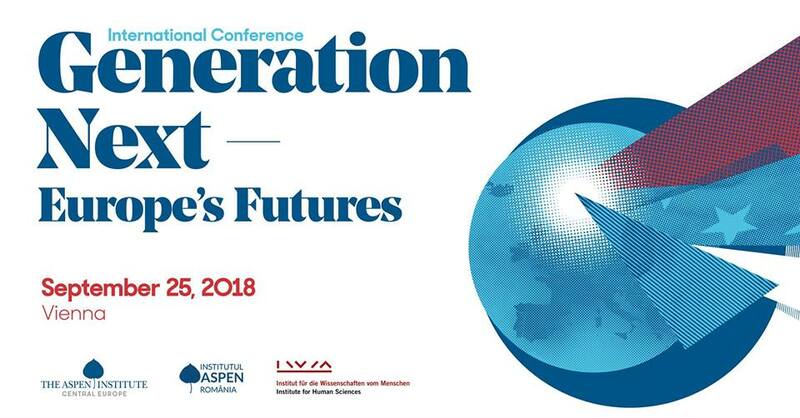 AIR is organizing, in cooperation with Aspen Institute Central Europe and the Institute of Human Sciences (IWM), with the support of Erste Group, Generation Next – Europe’s Futures Conference. The Conference will take place in Vienna on September 25th, 2018, and is the first event of the Future of Europe Task Force meetings, which are to be held in Austria and Romania during their respective Presidency of the Council of the EU. The conference will consist of two blocks. The first one (The Future of Europe: Is There a Common Way Forward?) will focus on the challenges that the EU is facing both politically and economically, seeking to provide concrete policy recommendations for improving EU governance, and the second one (Digital Europe: Is Digitalization Bringing More Unity or Disparity to the EU?) on digitalization and its risks, looking for solutions to avoid the digital divide threatening the EU both externally and internally, and for recommendations to boost competitiveness and connectivity across the EU, with a special focus on Central and South East Europe. Furthermore, a roundtable discussion with members of the Aspen and IWM communities in South East and Central Europe will be organized. 10:00 — 11:15 The Future of Europe: Is There a Common Way Forward? Europe is facing a variety of challenges, both politically and economically. Recent developments have opened debates on the future shape and direction of the European Union. The purpose of this panel is to push the deliberative process about the future of Europe beyond the existing divides between Member States, to outline scenarios accentuating the EU as a solution rather than a source of problems. An open debate of political and business leaders from Central and South East Europe, including the Austrian Presidency, will seek to provide concrete policy recommendations for improving EU governance to the successive EU Presidencies, while focusing on providing fresh ideas to the coming European Summit in Sibiu, which will play a key role in shaping the EU for the decades to come. 11:45 — 13:00 Digital Europe: Is Digitalization Bringing More Unity or Disparity to the EU? While Industry 4.0, digitalization and artificial intelligence offer effective solutions for a number of actual challenges, they also raise concerns about their social impact, employment, education, and last but not least, about governance. Central and South East European countries are the most dynamic within the EU. Their fastest convergence is happening in digitalization. The region’s digital infrastructure is relatively well developed, as Central and South East European member states are almost on par with the EU15 in terms of internet access and mobile broadband usage. However, the low level of digital public services (eGovernment) remains their main drawback. Despite the abovementioned developments, the countries in the Central and South East Europe are the most threatened by the digital revolution. The panel will seek solutions to avoid the digital divide threatening the EU both externally and internally. Digitalization, often perceived as a threat, can bring inclusive solutions as well. This panel will look for recommendations boosting competitiveness and connectivity across the EU, with a special focus on Central and South East Europe. Will the basic democratic structures in member states hold against the influx from the extremist political parties? Is the European Union vital without a shared foreign policy on state-on-state aggression within Europe, without a joint asylum policy or while enlargement is yet a distant promise? Does the European Union still wield a positive vision of the future? Scrutiny of politics and policies by forward-thinkers from civil society, academia and business.